ADHER project supported by European Union in Lifelong Learning program has been started in August 2009 and ends at July 2011. The partners are spread over Europe: Italy, Greece, Romania, Slovenia, Turkey, and Lithuania. The coordinating institution is the Lifelong Learning Centre in Samsun (Turkey). 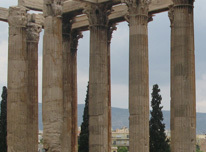 The general aim of this partnership is to increase and empower the mutual understanding and dialogue among different cultures by improving the knowledge of people about cultural heritages and helping them find innovative ways to access to knowledge of cultural heritages since it is an essential factor in the identity of each country and a privileged means of facilitating mutual comprehension among countries. During the project meetings it was agreed to construct the lists of cultural heritage to be used for education purposes in each project country and to share the practices and experience acquired. The Educational Approaches to World Heritage developed by UNESCO can serve as educational Methodology to our project as well. The Educational Resource Kit for Teachers, provided by UNESCO is available for downloads also here, at the right side menu for convenience of users. - disseminate the results and outputs at local, regional, national and European level by organizing meetings, publications and a webpage.